This week, we'll be discussing Part 3, Chapters 1 to 3 and Part 4, Chapters 1 to 2. To depict our thoughts in the most coherent way possible (after all, this is a dialogue between friends), my font color will stay black and Jackie's color will be red. Jeanna: This chapter is rather short. However, we get introduced to a new character. Lila Bard. She’s a pick-pocket in Grey London, stalking the streets at night dressed as a man. She’s quite an interesting character. I just hope the further we go into the story, we learn more about her backstory. As for now, we know very little. What do you make of Lila? Jackie: As for Lila, I thought her to be very interesting. She adds a very different tone to the story, even in this brief introduction chapter. I thought it was interesting that she finds it thrilling to be faced with the possibility of being caught or found out, as she was talking with a constable who ends up showing her a WANTED poster with Lila’s picture. Lila finds this amusing more than anything, so I think learning more about her will prove to be very intriguing. Jeanna: I love what Lila has brought to the story so far. And you’re entirely correct that she brings a different tone to the story. She has a more positive, if not more twisted, way of looking at things and I really love that. For me, she sort of channeled Jack Sparrow and Flynn Rider a bit in that she’s so confident she isn’t going to be caught and it’s so thrilling to her that she may be caught. A small side note about Schwab’s structure of the book. So, far we’ve read 3 parts of the book and not a lot of books separate chapters into parts. However, I find that I love what Schwab is doing here. In the first part, we got introduced to Kell. The second part shed some light on Rhy and finally, the third part is giving us Lila. It’s really interesting how the story is taking shape. Now, back to Lila. The initials did remind me of Kell’s knife. It may be just a coincidence. However, it’s interesting how Lila feels a sort of connection with the watch, in that she doesn’t want to let it go. She keeps taking it out of her pocket, hoping it might tell her all its secrets. Jackie: I’m really enjoying the structure that Schwab has given this book as well. I enjoy reading the chapters in parts because I feel like with each part to the chapter, I get to know more about that character (or characters), as well as get to know more about that particular London section that that/those character(s) are currently in. I agree with your ideas about Lila as well, and Lila, although she may prove to be boldly different from the characters we have gotten to know so far, seems to me that she may be the character I’m going to end up loving by the end of the story. I have a feeling that she is somehow going to be an important character in this book. I found it intriguing that Lila did keep taking the watch in and out of her pocket to inspect it, and check to make sure it was there, as a safety blanket of sorts. I’m starting to wonder as well since Kell doesn’t remember his past and why the engraved letters are on his knife, that maybe Lila has some type of similar connection as well to this pocket watch. Did she have a connection with this particular watch at a different point in her life? Is that why she feels so pulled to keep this pocket watch? Jeanna: If she did have a connection with the watch before now, she doesn’t reveal it. In fact, she doesn’t say much about her past at all. And I think readers can assume that she has been thieving for quite some time. However, there could be a connection with her and the watch that she does not remember. Similar to how Kell cannot remember his past. Was she a victim of a memory loss spell too? In this chapter, we follow Lila home. And by home, I would have to say she lives in a rather unusual place. But for an aspiring pirate, what other home would anyone expect? She lives on a boat titled the Sea King, owned by Powell (a total loser and drunk). She pays him in coins each month and he supposedly, leaves her be. But not tonight. He comes barging into her room and demanding his payment. And this is when things get heated. For one thing, Lila mentioned her paying rent in passing so I thought she must have already given her rent that month. I could see Powell bothering her for rent when drunk, even though she had already paid. And that’s what I thought was going down. But she gives him money but it isn’t the amount agreed upon. And Powell isn’t happy about that, demanding her to pay in any way she can. And, just, nope. Not okay. So he got a stab to the chest and Lila got out of there as if she had nothing to do with it. And she burns the whole boat down. When I read that she burned the whole ship down, I thought that was a bit dramatic. Like, yes she wanted to get rid of the evidence. But she could have carried him overboard and gone off on her adventure. Jackie: So, like you said, this chapter got HEATED, and very quickly might I add. I thought that Powell wasn’t going to go to the lengths of telling her to use ANYTHING to pay him back, including using her body. But, I was dead wrong (see what I did there?). Anyway, I thought that her defending herself was fine, and I mean, after she does stab him and believes him to be dead, I didn’t really think it was too much of her to burn the boat. She was talking about the Sea King as if it was an old boat that had already fared its days at sea. I thought it was somewhat metaphorical for her to burn down the boat since it was called the Sea King, but Lila should have a boat suited for herself, like Sea Queen, or something to that effect. So burning down the Sea King was just an obstacle in her path to becoming a pirate and having her own boat with her own adventures in store. Just as a side note, I don’t believe Lila to be evil as this song might suggest, but she reminded me of this song as she indifferently set fire and watched the boat sink. Jeanna: Lila, for sure, had every right to kill Powell. But, I thought, the act of burning the whole boat down was a bit much. It was a classic action movie stunt, walking away from the object you set fire to. Setting fire to the boat was rather an impulsive action, I thought. Though I didn’t sense much panic in Lila, I don’t think she was thinking about the future. Now, she doesn’t have a place to sleep and it’s the middle of the night. She doesn’t have her disguise on (does she? Besides her man’s clothes) and she’s carrying around her belongings. I like that song and I can totally see it playing the background of this scene. Jackie: I see what you are saying about her being impulsive and dramatic in what she is doing to the boat, but isn’t that the life of a pirate? That’s what she says she feels most like, and I feel that the pirates I’ve seen in movies like Jack Sparrow, for instance, are anything but predictable. He is constantly performing actions that are spontaneous, dramatic, and are not well thought out. 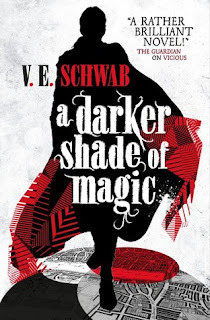 Maybe Schwab wants to show early on that Lila is just living up to her characteristics as a pirate, and that her impulsiveness, rash and maybe bad decisions, and the fight in her are all just revolving around her innate want and soul, which is that of a pirate’s life. I may be wrong, but I thought this scene helped to settle that tone we were talking about before. Out of all of the characters so far, I feel that she is the most settled into her own skin and accepts who she is and who she wants to be. Kell, I feel is slightly haunted by his unknown past as well as some of his abilities that he is capable of, and Rhy wants to be a better person and be more capable than he is (I chose these two characters because I feel that we know them the best out of all the other characters right now in the story). Anyway, I don’t want to keep rambling on, but I just thought these actions were suiting for the stereotypical characteristics of a pirate. Jeanna: Well put! I get what you’re saying and yes, she is acting exactly as a pirate. Ah, I just love a good pirate book. I didn’t know this book would have any pirates but I’m so glad we found Lila. As for her character, I agree with you that she is the most comfortable in her skin. She knows what she wants and for the most part, knows how to make what she wants happen. And I think she will get her pirate adventure before the book ends. That’s for sure. In chapter 3, Lila walks away from the burning boat with such confidence. She’s going on her adventure. Don’t anyone mess with her. She passes the Stone’s Throw Tavern -- that fixed place just keeps showing up -- and decides to ask Barron for a place to stay. Lila was going to pay with her watch but he doesn’t accept it and lets her have a room, under trust that she will pay him later in coins. The Stone’s Throw, like Kell has mentioned before, is a constant in all of the Londons. In Lila’s eyes, it is a place that pulls her in like a gravity field. The tavern is significant but in what way? Why does this place have so much power? Anyway, I found it interesting that Barron trusts her to pay back the amount since first of all, I guess they have a history since I remember Lila contemplating what Barron’s reaction may be if she saw him or asked to stay, since the last time did not go so well, as Barron recites the story of their last interaction upon seeing Lila for the first time since then. I guess with certain people that Lila has encountered she has made more of an effort to make some kind of trust form between them. For instance, Lila and Powell did not have much trust, and Powell had too much to drink, since he demands payment of any form right then and there when asking for the money, so I’m assuming Lila had a not so trusting history of payment with Powell. On the other hand, it seems like Lila and Barron have a relative amount of trust in one another since even after Lila went storming away from Barron on their last encounter, Barron still trusts that she will pay him back for renting out a space. Along with that, as far as Stone’s Throw Tavern, I’ve been thinking more about the semantics of the name. Stone’s Throw...like a stone’s throw away from home, somewhere anyone can go to feel a sense of belonging among a group of strangers? Somewhere that feels like the comforts of home, some place where the worries of your reality fade away, and you just are able to be whomever you want while inside this tavern? I’m not sure if this plays into it, or if it has more of a magical pull on the characters, but the name is definitely interesting on its own. Jeanna: The name of the tavern is interesting but the name itself does not follow into each London. The name does change, whether it’s the Setting Sun or the Scorched Bone tavern. I do like the name: Stone’s Throw Tavern and think it has become a place for people of Grey London to find comfort, however one can in a tavern. As for Barron and Lila’s relationship, I agree with you. There is a certain trust between the two of them that was not present in Lila and Powell’s relationship. I wouldn’t call them friends exactly but I would call them strong allies. And Barron is probably one of the best allies she has. He is the owner of the Stone’s Throw Tavern. He probably knows a lot of the town’s secrets and rumors, over what he has heard his customers say when the drink loosens their tongues. He probably knows about the best hiding places. And since Kell’s Black Market business stems from the tavern, Barron may not be fully following the law either. It’s a good relationship that will definitely help Lila in some way in the future. Also, I found it interesting the difference in the relationship Barron has with Lila and the one he has with Kell. Barron barely speaks to Kell and I wonder if this goes back to how people fear/respect him because he’s an Antari. Jackie: That’s a good point about the names being different among the various London location. I guess we will see why the tavern pulls people in the way that it does. That’s an interesting point that you make with Kell and Barron, maybe he doesn’t speak to him as much because Kell is an Antari...I remember Kell saying that him and the bartender just basically say hi to one another, and that’s basically it. He may fear him, or maybe Kell and him don’t really have anything to gain by talking with one another. Now that I think about it, when the characters go into this tavern, each of them is looking for something to gain. Kell is looking to collect and to sell his magical boxes; Lila, I’m guessing a bit here, may be looking to gain the comfort of something that feels familiar to her, or be amongst her own kind as well. Jeanna: That’s an interesting thought. I wonder if it will continue further into the story: that whoever comes to the tavern will be looking to gain something. We have already discussed that it is most likely Ned from the first part of the book will return, looking for his bit of Earth. He is essentially looking to gain something. A new part jumps back to Red London, where Kell is giving Rhy magic lessons. And surprisingly, Rhy doesn’t have much skill in magic at all. He seems to be the best in fire magic but if he loses his concentration, it can get wildly out of hand. Rhy seems to be one of those people who are difficult to read. He hides behind jabs of sarcasm that one never knows are serious or not. I absolutely love his character! In this chapter, it seems he keeps distracting (not only himself but) Kell in pushing him to go out with him that night. Instead, though, the King comes in and ruins the fun, giving Kell a message to pass along to White London. Seriously, does Kell ever sleep? He leaves immediately for White London, at nightfall, to deliver his letter. Jackie: I think, and Rhy mentions this in the chapter but it is not explained to the reader yet, that with whatever Rhy did to Kell some time ago really psychologically messed up Rhy. Rhy mentions that he was working with the fire element, but it got out of hand, and that Kell had maybe been severely hurt, or something like that. I think that because of whatever repercussions that incident had, that Rhy uses sarcasm to hide behind the pain he feels or may have caused to other people. Rather than explaining to the readers what that incident was, it was a passing thought of Rhy’s followed by a sarcastic comment, just like you had mentioned. During Kell’s time teaching Rhy, he asks Rhy why Holland had visited the other day, and Rhy just passes it off as delivering a message, but Kell seems to think that there was more to it. Although Kell doesn’t push for a more detailed response, I remember back in the chapter that Holland had visited that he had given Rhy the gift of strength. Obviously, this wasn’t strength in magic since Rhy hasn’t seemed to grown in any type of elemental magic strength when working with Kell. I also remember interpreting the chapter in that Holland may have made Rhy forget some part of his visit to the castle. Now, Rhy may have had lack of details about Holland since he just did not want Kell to know about this “gift,” or he could have really forgotten that Holland had given him strength. I’m not sure which it is, but I’m interested to find out, since we are going to be visiting White London (as the title of this section illustrates), I’m assuming we will be running into Holland (which we eventually will). I thought it was such a party pooper moment when the King had Kell go deliver the message to White London. Kell was disappointed too since he wanted that drink with Rhy. Why do dad have to ruin the fun? Also, maybe we should name Kell, the Never Drowsy Kell since I do not think he has slept at all. Jeanna: It was only mentioned in passing but something big must have happened in the past to have Rhy react that way to Kell, during the lesson. I wish he had told us what had happened. Rhy freaked when Kell was forced to use his Blood Magic to put Rhy’s fire out. I don’t think it has anything to do with the fire at all. Instead, I think, Rhy must have done something to Kell concerning his Blood Magic. I’m envisioning something along the lines of Rhy trying to practice blood magic-- but when it failed to work on himself, he turned to Kell and maybe Rhy cut Kell or almost bled him out. Maybe. I don’t know, I’m just guessing here. It is interesting that Kell did not seem to register Rhy’s concern. Instead, this event may have happened before Kell was put under the Memory Loss spell. Or maybe it is the exact event that pushed the King and Queen to have Kell lose his memory to keep him in their good graces, or something like that. Maybe. Anyway, we know Rhy is keeping secrets. Holland comes to his room, unannounced, and he doesn’t tell his best friend about it. That’s a red flag. It could be like you said, that Rhy just doesn’t remember Holland’s actual visit. But I think Rhy is hiding something. And, no, the gift from Holland must not have been strength in magic. Parrish heard some exchange or rustling of papers, which leads me to think that the gift was something physical, not in magic at all. Again, we get to see how the King interacts with Kell. And I don’t think it’s very nice. It’s nearing night fall and he wants him to leave right now to deliver a letter to White London. I get it, Kell is the messenger between worlds. But couldn’t this have waited til morning? And how the King just came right in and it just seemed more professional than anything else. When the last chapter, we saw the King and Queen and they seemed to welcome in Kell as family. Jackie: I agree with you that this incident between Kell and Rhy may have been about Blood Magic. I also agree that this may have been the incident that created the need for the Kell’s forgotten memory, since Kell doesn’t really have a reaction to Rhy’s concern. But, we weren’t told yet what this was, but I have a feeling it’s linked to Kell’s Antari abilities. I think Rhy may be hiding secrets too, which is a shame because him and Kell get along so well. Whatever he may be hiding must be bad since Rhy probably thinks that if he tells Kell that either Kell will be mad at him or he will go off to talk or confront Holland, and maybe Rhy doesn’t want that for some reason. I think that the King’s pushiness may have just been the nature of whatever message that he wanted to send to White London. I think that the Red King and Queen still value Kell and think of him as a second son, I just think that whatever message or information that needed to get to White London was very urgent, so that’s why he was sent at night. What I found more interesting was that Kell seemed to have some reservations about traveling to White London, so this makes me excited and curious to know why Kell, in his own way, expresses a bit of hesitation and fear in traveling to White London. What is there that is so intimidating? Jeanna: I see where you’re coming from and you’re probably 100% right. I still, also, think the King and Queen see him as family. I just… it’s so hard being the only Antari of Red London. Whatever are the contents of the letter, which we were not told about either, is probably very important and cannot wait until morning. And I, too, have some fear and hesitation about traveling to White London. It’s the starving London, which sounds a bit terrifying to begin with. Plus, it’s next to Black London which is even scarier. I’d much rather find my adventures with Lila right now. Without much fanfare, we are in White London. He seems to take the same route he took to get to his own palace in Red London. I wonder if the palaces are also a fixed point on the map. He takes the path by the river. The city seems devoid of color, everything covered in grays and whites, which may be ash lingering in the air. Kell doesn’t mention much of how White London became to be what it is, just that they were hungry for power, trying to conquer magic. White London seems to be made of stuff from nightmares. You have bound, robotic guards. And, I don’t know, just reading about it made me shiver. Holland shows up to guide us into the palace. And Kell mentions learning something about Holland some time ago, a rumor: how Holland is bound to the twin rulers of White London, similar in that of the guards who are robotically bound but not so, in that they do not control his mind. That’s interesting which makes his gift of strength towards Rhy even more fishy than before. Holland does not make personal visits, so whatever he gave Rhy must have been officially from the rulers. And we meet one of the rulers, Astrid, who immediately felt like a villain to me. The whole of White London was grim and terrifying, I can only imagine what Black London will be like if Kell visits there next. Jackie: Yeah, I agree with you on all those aspects of White London thus far. Even Kell takes extra caution as he is walking through White London, something that he has not expressed about Red or Grey London. I remember when I was reading about the guards being controlled, I mean even Kell said that is forbidden in Red London, I mean mind control is crazy! Especially since we are aware of this as readers now, as Kell informs us on his walk around White London, like that’s so creepy! Just blank canvases, staring at you and taking orders, that’s all they are capable of at this point...ugh...I’m getting shivers down my spine thinking about it. I told you there was something off about Holland giving Rhy a gift!!!! I knew it! Especially now that we know the rulers probably were the ones orchestrating Holland to do whatever it was to Rhy, that makes this even creepier and more dastardly! Astrid felt like a villain to me as well. Especially as the reader was being told that the statues may have been real people once, and were those who the rulers has murdered to get to and stay at the top as rulers of White London. Like, that’s pretty messed up. Keeping your killings on display for the whole kingdom to be reminded of, like “this is what you are up against.” Shouldn’t a ruler, or rulers in this case, make you feel safe, and not threatened? Jeanna: The reminder of the statues serve as a symbol of their strength. And strength means a lot to people in White London, it is what their whole kingdom is based on. In terms of Rhy’s gift, that must be some significant gift to share strength with the Prince of Red London. It makes me wonder if Rhy is not trying to overthrow his parents or something along the lines. Are Rhy and the White London rulers working together in something? Anyway, White London is very different from Red London. One thing I found most interesting is that no one has any use of the English language. Red London prides itself on being equal with magic. However, they create ranks in their people by speaking a royal language: English. English is the speech of Kings. That’s incredibly interesting next to White London, a place where people fight to be the strongest, find no use whatsoever in separating the people in that way. This creates an equal standing between the people; everyone, if they please, can have the chance to become King. They do not treat magic in the same light. They’re flaws in both systems and even though White London is absolutely scary, with the right leader, they maybe could turn things around. Jackie: That’s an interesting thought that Rhy and the White London rulers may be working on something together to overthrow the Red King and Queen. If that is true, then my big concern would be, how does Rhy know he can trust the White London rulers? Yes, I found the way that they speak and treat each other in Red London versus White London to be incredible. I mean on one hand, you have Red London that values the spoken word of your worth in nobility and your social status. On the other hand, you have White London, where basically violence, the thirst for power, and pride are what gets you to the top. I think it’s interesting that the author presents both ideas in a way that lets the reader consider the two situations and maybe make predictions at what exactly got each London location to the point that it is at now. I mean, why didn’t Red London fall to the same level as White London, or vice versa? What were the circumstances after the Black London incident that made Red London and White London into what they are now? I’m just intrigued by these unknown questions being posed to us, as readers, and allowing us to use our imagination to guess until we are told the actual background of how each of the Londons got to where they are presently. I mean I hope they give us more background anyway, I’d be interested to know why the people living in each London location have the opinions and uses of magic that they do. They must have faced certain obstacles that drove them to where they are now, and then somehow convinced others to join in on their way of thinking. Jeanna: There are just so many questions! I also like that Schwab is leaving it rather open-ended for us to assume or believe whatever for now until she reveals what actually happened a bit later. It’s a great way to build her world. One thing I have noticed is that, just like we suggested, the people of White London are starved for magic. They are greedy for any taste of it. In treating magic as a thing, an item to conquer, they are losing their grasp on it. I think Red London has found the balance with magic which is why they are able to keep using it. They treat magic as an equal, they speak to it and it listens to them. I hope Schwab, though, begins to answer some of the questions of her world and its history. It will be so exciting how all these characters will come into play. This week we were introduced to Lila Bard. At what lengths is Lila willing to go to to protect herself and get what she ultimately wants, to become a pirate? Does she have any limits? We are getting to know more about and have more interactions with Stone’s Throw Tavern. Between the characters that we have met, Kell and now Lila have a pull towards this place, but why? Why do you think this particular tavern attracts people of all kinds and pulls them in? What do you think Rhy has done in the past to be so concerned for Kell when he uses his blood magic? Holland is said to be bound to the twin rulers. However, Kell learned this from a storyteller and it could very well be just a rumor. What do you believe?